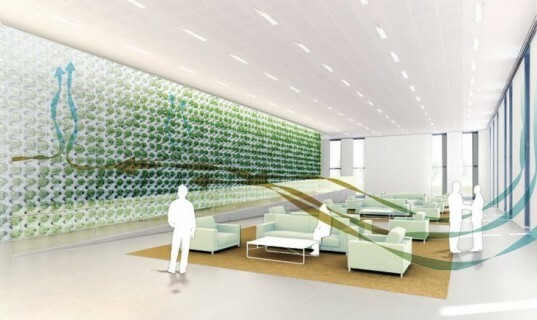 The Center for Architecture Science and Ecology (CASE) developed a clever green wall system that can effectively reduce airborne pollution while saving energy. Dubbed the 'Active Modular Phytoremediation Wall System' (AMPS), the long winded name is actually a straight-forward approach that maximizes a plant’s capacity to clean the air, thus reducing the need for outside fresh air in buildings. The collaboration between SOM and the Rensselaer Polytechnic Institute shows great promise in adding some green relief and reducing a building’s energy -- which is just about as good as building technology can get. 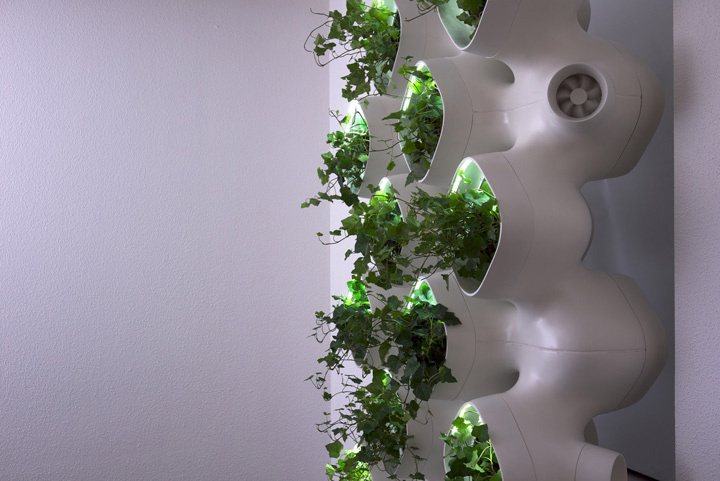 The modular wall system provides habitat for multiple types of plants including English Ivy, Boston Ferns and dieffenbachia, which are all fed water and nutrients through a hydroponic system. The key to the effectiveness of the design is through blowing air across the plants rhizoshpere, located on the surface of its roots. The biologically active surface can absorb 200 times the pollutants than the roots or leaves of a plant, thus dramatically improving the system’s capacity. By recirculating air through the AMPS, the system can provide 60% of the fresh air required by ASHRAE 62.1. Typically that air would need to be sourced from the outdoors, and would then need to be heated or cooled at a high energy penalty before being circulated. Thus the reduction in the amount of incoming air required provides a large cost savings. Aesthetically AMPS is a dynamic green wall that has a parametrically sculptural quality. The modular system can wrap around columns, band around rooms, or take up entire walls to suit the programmatic needs of the designer. The modular wall system provides habitat for multiple types of plants including English Ivy, Boston Ferns and dieffenbachia which are fed water and nutrient through a hydroponic system. The key to the effectiveness of the design is by blowing air across the plants rhizoshpere located on the surface of its roots. The biologically active surface can absorb 200 times the pollutants than the roots or leaves of a plant, thus dramatically improving the system’s capacity. By recirculating air through the AMPS the system can provide 60 of fresh air required by ASHRAE 62.1. Typically that air would need to be sourced from the outdoors which would need to be heated or cooled first, and since the energy penalty is high in building to achieve this anyway to reduce the amount of incoming air is a large cost savings. Aesthetically AMPS is a dynamic green wall which has a parametrically sculptural quality. The modular system can wrap around columns, band around rooms, or take up entire walls to suit the programmatic needs of the designer.